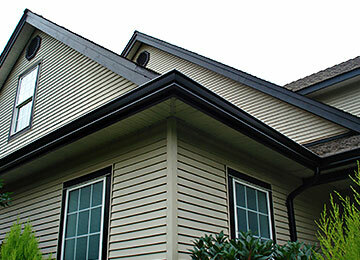 Regular cleaning of your eavestroughs can save you a world of worry, not to mention costly damage repairs. The ability of the eavestroughs to drain properly and completely is significantly reduced when there is a build up of normal environmental materials including dust, leaves, snow and ice. Wind storms can also deposit bits of paper and plastic in the eaves that can block run off. Cleaning is recommended in the early spring and late fall, but if you ever notice water dripping or spilling over the edge of the gutter, that’s a tell-tale sign that cleaning or repair is needed.